Choose the fabrics. Having the inner lining made of fleece and the outer lining made of flannel works well. You can even cut up old flannel blankets, shirts or whatever fabric that suits you. I used a receiving blanket for the outside (flannel), and just some plain white fleece on the inside. Cut open a brown paper bag to use as pattern paper, and draw an hourglass shape. 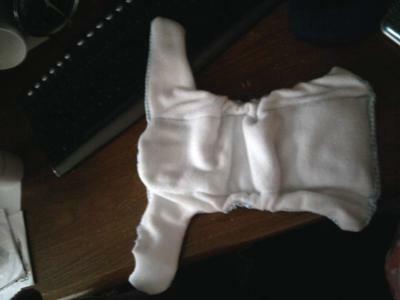 You can use another cloth diaper as a template. Snip out your pattern piece and place it on the fabric for your cloth diaper. Have the right side of the fleece facing the right side of the flannel. Trace around the pattern piece with a pencil, then use a ruler to add 1/2 inch seam allowance all the way around. Cut out the fabric around the outer line. Don't forget to pin it! Create a soaker out of a rectangular piece of burly terry cloth or what I personally love, micro-fiber (it's extra absorbant). This should run the length of the diaper. Pin this to the wrong side of the fleece and sew it into place. You can have two layers of soakers should you have a heavy wetter. I folded it extra in the front, since I'm expecting a boy. Measure the thighs of your baby (or just make a guess) and cut two lengths of 1/4 inch elastic the length of the baby's thigh. Pin this to the wrong side of the flannel and sew it into place, being careful to make certain the elastic is stretched as you do so. Use a zig-zag stitch on your sewing machine or an elastic stitch if you have those options. Measure the baby's back, and cut a piece of elastic to length. Stretch this along the whole back of the wrong side of the flannel, pin and sew it in place. Pin the two fabric pieces together, and sew around the stitch line on a sewing machine. Leave one end open. Turn the fabric right side out, and close the open end by hand or with a sewing machine. Close the diapers with either diaper pins or by sewing Velcro tabs on the diapers. Either option makes the cloth all-in-one diaper adjustable. Meaning, YOU SAVE MONEY!!!! This is the first thing that I have ever sewn before. And it only took me about two hours! It was no problem at all (besides realizing half-way that I didn't have any elastic, oops!). But really, if I can do this... you can do this. Cloth diapers are a great way to save yourself some money.. especially if you can make it youself! Not to mention that it HAS to feel way better than a disposable diaper... who would want to wear that all day? Cloth diapers are good and they work well for the kids. The biggest advantage is they prevent occuring rash and writing service offered me good advice about cloth diapers when I am writing an article about health probelms in children. Your website is very interesting and keep posting the useful information. 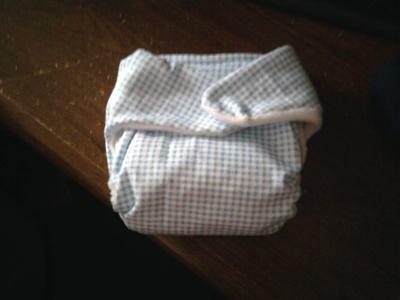 It is very difficult to make from scratch a cloth diaper, it is much easier to buy it if you are a mother who uses eco-friendly baby products and doesn't want to buy disposal diapers. Also, these mothers like to buy only quality clothes for their baby, like these thematic Yankees baby clothes and superior baby products. Wow, this is awesome. today we cannot take risk by buying the diapers from outside. 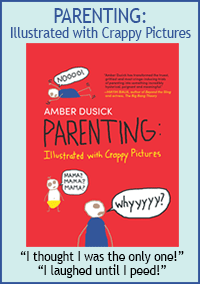 There are so many news telling the truth and the side effects of using the diapers. So I was planning to make one on my own. Thank you so much for giving me the idea.